This pair of black hook and loop fastened elastic Knee Dot Straps are used to visually mark the tibial tuberosity (bump directly below the knee cap). This pair of black hook and loop fastened elastic Knee Dot Straps are used to visually mark the tibial tuberosity (bump directly below the knee cap). They work great in conjunction with the Self-Leveling Laser to facilitate seeing the frontal view (Z-plane) while the cyclist pedals. Knee Dot Straps work great over tights, with sweaty and/or hairy-legged athletes (unlike stickers) without leaving a permanent mark (unlike a pen). 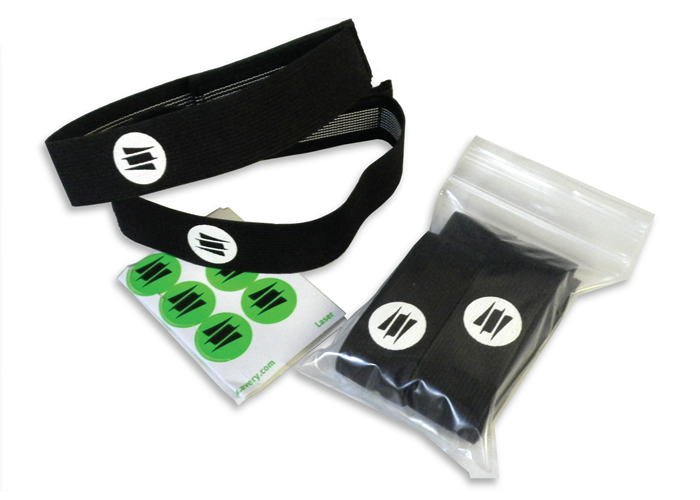 The Knee Dot Straps, Sticker Dots and Self-Leveling Laser can be purchased at a discounted kit price.